Chinese Lunar Year is coming! Hello, we hope everything is going well at your sides so far. On the other side, we are preparing to celebrate the coming Chinese New Year and our office will be closed from Jan. 29 to Feb. 04, the factory will be closed from Jan. 29 to Feb. 15, 2014. Chinese New Year is an important traditional Chinese holiday celebrated on the first day of the year of the Chinese Lunar calendar (often in Feb. of the international calendar), so it is also called "Lunar New Year". There are 12 symbolized animals for the Chinese New Year: Rat, Ox, Tiger, Rabbit, Dragon, Snake, Horse, Goat, Monkey, Rooster, Dog, Pig. These animals take turns to be the symbolization of each year, that's why it often has an animal on some Chinese New Year cards. 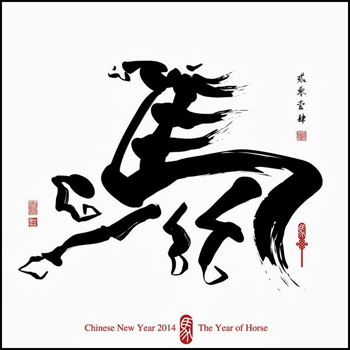 The animal of this year is the horse and we want to give our congratulations to you with words of horse: "Ma Dau Cheng Gong"! "Ma" means the horse, the four words mean "Wish you be successful instantly when the horse year is arriving!"